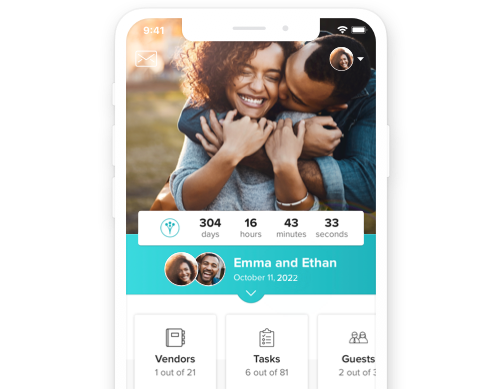 Easily track every to-do with WeddingWire. Stay organized with WeddingWire&apos;s free, customizable Checklist. Tell us a little about your wedding and we'll create customizable tasks for every stage of your planning journey. Add, edit, or delete tasks at any time to easily customize your WeddingWire Checklist! Easily see what tasks you've crossed off and what's left to do for your wedding. Your WeddingWire Budget integrates with your Checklist to ensure you never miss anything. I love it! I deleted items that don't apply to my plan and I add notes to items that have been started. I reference it ALL the time. ...it keeps my mind on track and helps me focus on other things without being stressed. I tend to stress about silly things and I don't want to be stressed before I get married! I feel like it's helped me with checking things off and realizing there are things on it that I didn't even think of! It's definitely useful! Planning a wedding has so many different moving parts — a written list isn’t going to cut it. So we created the ultimate digital wedding checklist. From booking the venue to going to the final wedding dress fitting, WeddingWire will keep everything in check. One of the best features of our wedding planning checklist is that you can access it from anywhere. Check off items on your cell phone, tablet or laptop, while keeping track of all your progress in one simple tool. We’ve helped millions of couples plan weddings, so we know that everyone’s checklists are different. That’s why WeddingWire gives you the ability to customize your wedding planning list. We’ll help you get started, but you can also add any item, at any time. Tracking your progress is a cinch with our wedding Checklist tool. We give you a clear picture of what’s next on your wedding list, how much is left, and how much you’ve completed. A successful wedding day depends on an organized, comprehensive wedding checklist — let us help you build one that will make the planning process easier.